1. Spread some flour on a clean surface. Open the Croissant roll and double it up (it’s too thin otherwise). Roll out using rolling pin. 2. Melt butter and grease 16-mini muffin pan. Spread remaining butter on the rolled out dough. 3. Sprinkle brown sugar and cinnamon on top. Use as much as you like. Roll into a log and cut into mini cinnamon buns. 4. 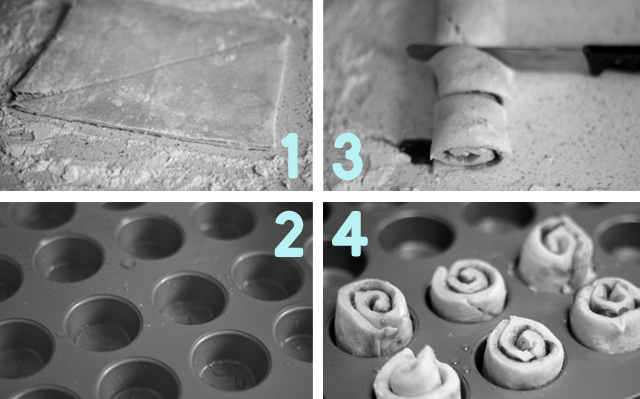 Place buns into muffin pan. Add a few more drops of melted butter onto each bun. Bake in a preheated over on 180° (fan forced) for about 10-12 minutes. 5. For the icing, combine a tbspn milk, with a drop of maple syrup and plenty of icing sugar. Mix until dissolved. Drizzle on to bakes buns.